High quality British made charcoal in convenient sized bags of 3Kg and 6 Kg. Being locally produced our charcoal is good for the environment with a low carbon footprint. British made charcoal is much better quality than imported charcoal as the wood from the British trees used is typically less dense than that used for imported charcoal. It is produced from local coppiced woodland which helps keep our woodland habitats in great condition for wildlife. If only half of the annual 60.000 tonnes demand for barbecue charcoal came from British Woodlands, instead of 5%, this would provide the financial incentive for the better care of 40,000 ha of Ancient Woodland. If only half of the annual 60.000 tonnes demand for barbecue charcoal came from British Woodlands, instead of 5%, this would provide the financial incentive for the better care of 40,000 ha of Ancient Woodland. You would also get better quality charcoal as the wood from the British trees used is typically less dense than that used for imported charcoal. 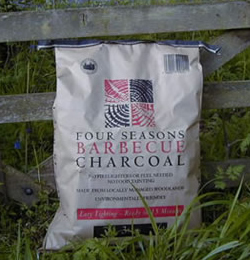 Four Seasons Charcoal is light in weight in 3kg & 6kg and does not have to be 'transported across the world' to get your BBQ. It is also produced from local coppiced woodland which helps keep our woodland habitats in great condition for wildlife. Our production of locally produced charcoal is good for the environment. British made charcoal does not need lighter fuel for starting so you won't have taints on the food. “Just twist paper and light” Our charcoal burns hot and reaches cooking temperature within 15 minutes. Whether you are using in tubs and pots or enhancing soil or aiding seedling growing BioChar is the answer. The retorts are 6 ft depth x 11 ft wide x 7.5 ft high. There are 2 charge cylinders, each are 6ft long by 3ft 4 inches and together will give you roughly 250kg of charcoal per burn (depending on what wood you use). The doors are made with 500mm of ceramic blanket sandwich in two plates of 4mm steel which help heat retention. The gases exhaust on the doors. When the gases are exposed and rise they pass throough the vent in the door travel down in the fire box exhaust system this is made out from 8m s/steel tube with 4 exhaust ports which are pass though the fire bricks into the fire box then the gases reunite and rise up through the spaced fire bricks around the cylinders down to the rear vents and then retort again. The entire inner part of the retort is lined with 500 mm of ceramic blanket which is important to keep the heat retorting around the cylinders. The burn time is 8 to 10 hours depending on the grade of wood you are using (8 to 10 hours is time based on OAK, ASH, BEECH or HORNBEAM). This is a lot less than with round kilns. 1. Take the door vents caps off. Light the door vents each side the retort; wait till the temperatures drop to 354 degrees C (remember to sand and seal the door vents) Then remove the rear chimney vents and leave to cools quicker. Next day unload.